Dainty pieces such as earrings accented by wire wrapping make Lacy Laura Gray's jewels unique, demonstrating their pure organic beauty. Organic stone types with raw patterns or textures are paired with pearl accents to add that feminine touch making each piece truly memorable. We absolutely died when we saw the Arctic Sea Blue Glass earrings! Aren't they beautiful for the beach? Wear your favorite white bikini and rock these earthy beauties by the pool side. We absolutely love their jaw dropping necklaces, these beautiful creations dangling on your neck at the beach paired along with your fave beach cover-up, will be all the rage. 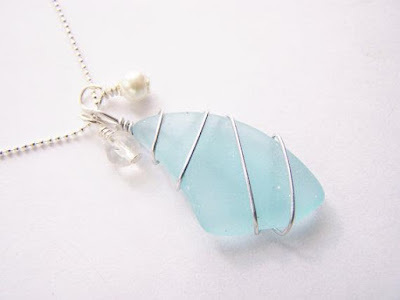 Wear this Seaglass necklace and you will be the "Belle" at the beach! At Lacy Laura Gray find a wide array of jewelry pieces ranging in all colors and appealing to every bikini fashionista type. Start your holiday shopping and visit their etsy shop! Join Lacy Laura Gray on Facebook!